A wonderful month of April took a tragic turn toward the end of the month as a massive earthquake struck the exotic country of Nepal, where we built our first international houses. We’ve since found out that the homes we’ve built in the Trishuli village just 30 miles from the quake’s center are all safe and sound, as are our partner families in the community. But there is now even more work to be done in Trishuli and all across the nation. If you would like to contribute to our disaster recovery fund, please click here. We had our Fuller Center Conference in Americus, Georgia, with First United Methodist Church being fantastic hosts. Also thanks to Koinonia Farm (where our movement was born) for the tours and hosting the closing dinner. For photos from the two-day event, click here. We officially marked the 10th anniversary of our ministry. 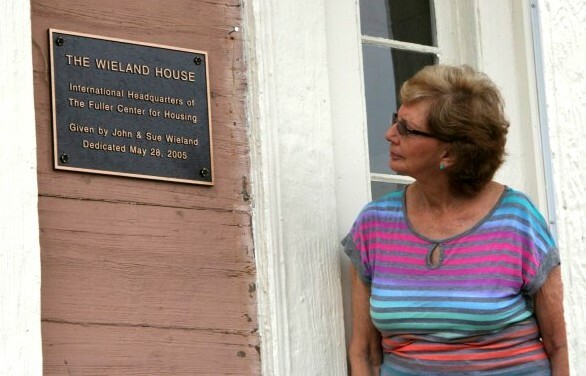 As part of the occasion, we re-dedicated our cozy world headquarters building in Americus as The Wieland House, in honor of John and Sue Wieland who donated the building. Click here for photos from the event. Our 10th anniversary seemed like a good time to produce a new overall video explaining The Fuller Center’s work. We hope you will share it with everyone who cares about families having simple, decent places to live. Click here to view it. Here’s a story we did about Lisa Malamis, who has started Cambridge Carter Real Estate in the Chicago suburb of Wheaton, Ill. Lisa wants to share her success in a wonderfully unique way — she is giving a portion of every sale to help The Fuller Center partner with families in need of simple, decent homes. We completed our first home in Pignon, Haiti, a new site for The Fuller Center. Click here for a photo. We’ve now completed eight homes and started six more in El Salvador’s coffee country, specifically a village near Ahuachapan. Click here for a photo of partner families. WLKY featured the work of our Fuller Center covenant partner in Louisville as part of the mayor’s Give-A-Day Week. See the story here. The Carroll News has this story on the Fuller Center of Greater Carroll Area (in Virginia), which is having a work day tomorrow to assemble wall panels provided by CrossRoads Missions for their next home build. Our Fuller Center Bicycle Adventure had another successful weeklong Spring Ride down The Natchez Trace Parkway. Click here to see some of the great photos from the week. The Chicago Tribune and Northwest Indiana Times offered these stories about families moving into Fuller Center homes in Gary, Indiana. Our neighbors across town at the Americus-Sumter Fuller Center dedicated their new headquarters across the street from the historic Windsor Hotel, giving them great visibility in the middle of town. Click here for photos from the dedication. Of course, the highlight of our spring was the celebration of Easter. Check out this great Easter blog from President David Snell on Jesus’ simple message that we should love one another. This is just some of what’s been going on at The Fuller Center. Be sure to follow us on Facebook and check out our YouTube channel regularly for updates.